HotWax Media hosted a special team building event this weekend in support of the broader OFBiz community. On Saturday, August 16, we conducted a 16-hours bug crushing marathon in our Indore office. Our purpose was to investigate and crush as many bugs as we can in the Apache OFBiz project, drawing from the OFBiz trunk Jira list. 1. 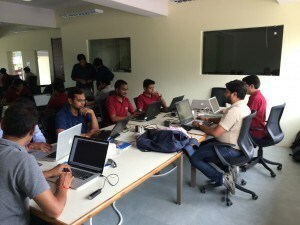 Event hosted in our new office facility in Indore, MP, India. 2. Started event on Saturday at 9:00 AM and finished on Sunday at 2:30 AM. 3. Picked a list of issues of type bugs from OFBiz JIRA. 4. A team of more than two dozens developers and reviewers continuously worked hard to fix as many bugs. 5. Followed complete SDLC for each and every bug, from analysis and design to development and review. 6. We had some of the best OFBiz experts in the world on hand to guide the efforts of the numerous developers who participated to ensure highest quality contribution. 7. Documented test cases for individual issues, that we fixed, on OFBiz Wiki. 9. Participants enjoyed delicious homemade meals and beverages throughout the day. 10. After completing the event, team plans watching a movie together. Here is the glimpse of our activity throughout the day on HotWax U channel on YouTube. This was a fun event with lots of learning. We are looking forward to organize more such events in near future. Lets come together to make Apache OFBiz one of the best enterprise automation software.